Use outdoor artificial bamboo as a lovely alternative to live planting. Convincing in appearance, artificial bamboo clusters are also non-discriminatory when it comes to climate. Insert outdoor artificial bamboo into any landscape, regardless of its proximity to or distance from the equator. 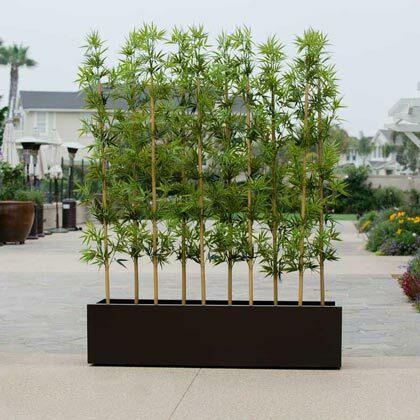 Planters Unlimited offers artificial bamboo clusters, outdoor artificial bamboo sold by the foot, and custom artificial bamboo ordering. In each outdoor artificial bamboo configuration the faux plants are impregnated with an agent for UV protection. This makes each standard or custom artificial bamboo plant, regardless of the order, inherently UV and fade resistant for superior longevity. Capture the striking appeal of bamboo without the limitations of live planting. To order outdoor artificial bamboo by the foot, artificial bamboo clusters or create a custom artificial bamboo order, contact Planters Unlimited. A knowledgeable project manager can assist you over the phone at 1-888-320-0626, 7am-5pm PST, Mon-Fri.
4'L Bamboo Artificial Outdoor Grove- Three Heights Available! 6'L Bamboo Artificial Outdoor Grove- Three Heights Available! 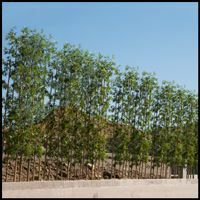 8'L Bamboo Artificial Outdoor Grove- Three Heights Available! Artificial bamboo clusters capture the exotic nature of live bamboo regardless of where your pin drops on the map. Outdoor artificial bamboo, brought to you by Planters Unlimited, is a faux alternative to high maintenance or unattainable live planting. Tall and fresh looking, our outdoor artificial bamboo looks and acts like the real thing - except for the whole part about needing water or live plant care. Available to purchase by the foot, in pre-determined artificial bamboo clusters, or as custom artificial bamboo configurations, we have the arrangement you need to bring this beloved plant to landscape designs or commercial interiors. The dark green hue of our artificial bamboo clusters makes each faux plant lifelike and striking in appearance. However authentic they may look, our outdoor artificial bamboo is free from the climate restrictions of their live counterparts. Also, each faux bamboo plant is inherently UV-protected by means of an agent that is impregnated into the resin during creation. Outdoor artificial bamboo from Planters Unlimited is resistant to fading from solar rays all on its own: no dangerous and expensive spray-on chemicals required. Our one-on-one attention to customers in need of custom artificial bamboo makes our service an attractive one for commercial landscape architects or project designers. Whether utilizing outdoor artificial bamboo as an aesthetic enhancement or as a functional barrier to hide undesirable or empty spaces, the right combination of artificial bamboo clusters can provide multiple solutions for your design scheme. Utilize outdoor artificial bamboo clusters to line walkways, flank fountains, place as privacy screens for outdoor dining areas, or as an attractive way to wall off gutters, trash receptacles or unrefined exterior surfaces. Outdoor artificial bamboo is sold and also ships un-potted. On orders of custom artificial bamboo that also require potting, a Planters Unlimited project manager can assist in finding and ordering commercial containers to meet specific needs. We offer a full range of commercial planter styles in durable and attractive materials like fiberglass, composite and wood. 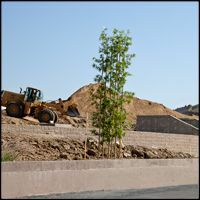 To order custom artificial bamboo for your commercial or large-scale residential project, a Planters Unlimited project manager is available to offer assistance. Please call 1-888-320-0626, 7am-5pm PST, Monday-Friday.